← Coxford Call March 2014: Community campaign to save our library! They didn’t forget that they were elected by the people of Coxford, Aldermoor, Lordshill and Lordswood, to protect local facilities such as Oaklands Swimming Pool and play centres, not to close them down. 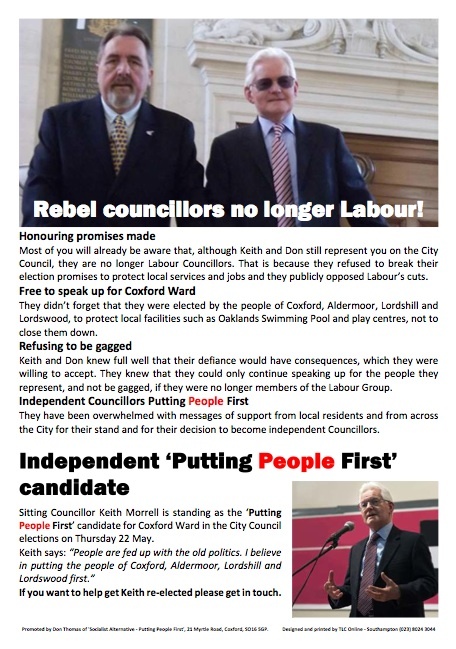 They have been overwhelmed with messages of support from local residents and from across the City for their stand and for their decision to become independent Councillors. This entry was posted in Uncategorized and tagged City Council, Coxford, Labour Councillors, local services. Bookmark the permalink.